Karla Curatolo teaching at Expressenz Dance Center. Photo courtesy of Curatolo. Owning a dance studio is a profession of a daily slog peppered with indispensable special moments. From cleaning the studio to keeping accountable to a larger vision for your business, the “to-do” list can feel endless. Yet treasures such as the smiles of your dancers in lights and seeing them grow over time can make all that work more than worth it. Sometimes grand opportunities become unforgettable memories. Take Karla Curatolo, owner and director of Expressenz Dance Center (Indianapolis, IN). Expressenz was asked to audition for the hit NBC show, World of Dance, in August of 2017. The school’s dancers made the cut, and what followed was quite an experience for all in the studio’s community who were involved. 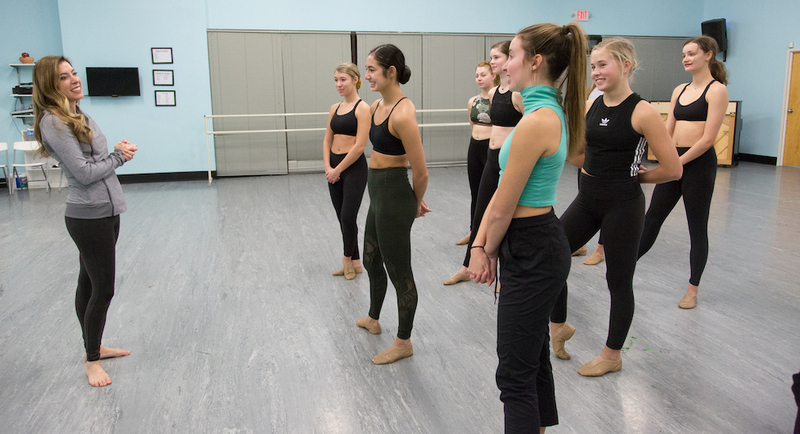 Here, Curatolo speaks with Dance Informa to share how she experienced the opportunity. She also describes the wonders and trials of being a studio owner, why she strives to maintain an inclusive studio atmosphere and more. Expressenz’s mission demonstrates broad inclusivity toward all who want to experience the joy of dancing. Some might think this conflicts with the high caliber of training and performance that your school also appears to offer. How do you find those two aspects in relation to each other? How do you feel that plays out at your dance center? “Most of my students started out in my recreational or pre-school classes. Our job is to train dancers and make them the best they can be. We don’t require dancers to be naturally gifted or already seasoned dancers to be a part of our pre-professional programs. We find joy in the process. What regarding your dance center are you most proud of? How might you wish to see the center grow and evolve? “The thing I’m most proud of about my studio is the culture I’ve created and the high level of training a dancer can receive at our studio. These kids spend more time at the studio than anywhere else; it’s important to have a positive culture at the studio. Most of our students would rather be at the studio than anywhere else. It’s their home. I love that! I love that we have created a safe space dancers can come train, work hard and have fun with their friends. Being a kid and teenager can be rough, and having a happy place to spend your time is so important. The other thing I love about our studio is our high level of training we offer. My vision from the start was to create a studio with both a strong competition team and a strong ballet program. I feel in today’s world, dancers need to be strong in multiple styles of dance. I grew up attending two studios, one to get great jazz/lyrical/contemporary/tap and another to get Russian classical ballet. I find many studios are one or the other, and I thought that was crazy. Why cannot a studio be great at both? So that’s how Expressenz was started. Dancers shouldn’t have to choose a focus; they should get great training in both genres. I was told the two worlds are separate for a reason, but I think more and more we are seeing those two worlds collide. 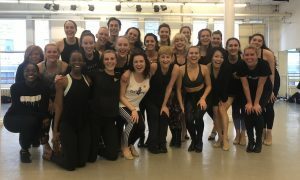 Ballet companies are doing more contemporary work than ever before, and it’s so important to have a great ballet foundation in the entertainment industry. Today, I have students who have gone on to join modern and ballet companies but have also done things that are more entertainment-based such as cruise ships, TV and variety shows. I love that my dancers can get high level training in things like jazz and hip hop while also training in ballet five to six days a week from renowned ballet dancers/teachers. What have you found most challenging about the business side of what you do as director? Is it sometimes in tension with creativity/artistry? What’s most helpful for you here? “The hardest part about being a studio owner and director is keeping people happy. I have learned it’s not possible to make everyone happy, but it’s in my nature to strive to do the best I can while also staying true to myself and my program. Dealing with lots of different personalities of parents, students and staff is hard, and you are in charge of all that. My communication, conflict resolution, listening and people skills is being tested on a daily basis. But I love business, I love a challenge, and I love what I do, so I don’t mind. I’m definitely a creative person, but I’m much more of a business savvy, type A (or as some call me, triple A) person. I feel I picked the perfect field for my personality. I love that I get to create and choreograph on dancers, but I also love that I get to run a business. I don’t find running a business to be hard; it is simply time-consuming doing it all on top of teaching and choreographing. Is there a piece of advice – or a role model/mentor – that has been particularly meaningful for you? Dancers from your studio performed on World of Dance. How was that experience for you? How did it seem to be for the dancers? “World of Dance was an amazing experience that I really cannot say enough great things about. It was a dream come true. All of the contestants and producers were incredible to work with. We made countless new friends throughout the experience. However, it was also the most emotionally and physically challenging experience that the dancers and I have ever been through. The pressure was high, and we were running on little sleep most of the time. Trust me, it wasn’t all glamourous. It pushed me and my sister as choreographers, and I definitely feel we grew from the experience. For more information on Karla Curatolo and Expressenz Dance Center, visit www.expressenz.com.